The Delivering Marketing Joy Podcast is back! Our goal here is to attack 2018 with a vengeance! The Delivering Marketing Joy Podcast will provide some inspiration, motivation and education to make it happen! Consider this your 10 minute “kick in the pants” to get your week started off right! 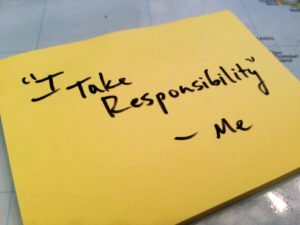 This week on the podcast we talk about taking responsibility for everything. People who are not successful do two things a lot…they create excuses and blame others. Not you. On today’s podcast we talk about how to take responsibility for everything…and not be a martyr. Thanks for listening! We will keep them coming. Let me know if you have any topics you want me to cover. And of course if you want to make sure you never miss a piece of content, join thousands of others and sign up for the VIP newsletter here.